The Indian sky is changing - the March winds are coming in and winter begins to bow out. 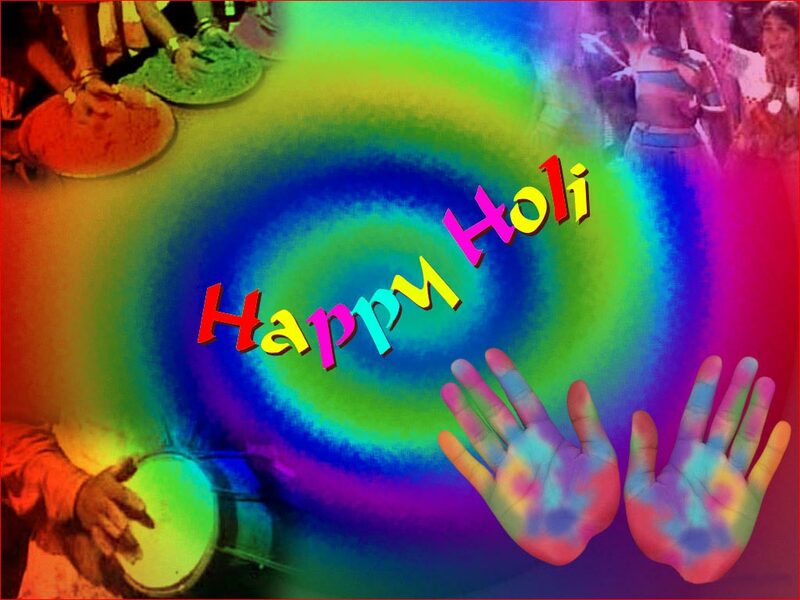 Holi is the festival that carries the country into the bright days of summer. A feeling of plenty is in the air - the crops have been cut, threshed and stored or sold. The farmer is at rest and money is at hand. ‘Holi’ falls on the full moon, in the month of Phalgun, which spans the end of Februry and the beginning of March on the Gregorian calendar. A time when Spring is in the air. The legend of King Hiranyakashipu is associated with the festival of Holi. This legend signifies the victory of good over evil, of devotion surpassing ambition. King Hiranyakashipu was an ambitious ruler, one who wanted absolute power so that he would be worshipped as God. When this wish was made known, the King's own son, Prahlad, refused to obey his father. Prahlad was an ardent devotee of Lord Vishnu, and it was only to his Lord that he gave allegiance. The proud King was enraged by Prahlad's disobedience and decided to punish him severely. He asked his sister Holika for help. It was believed that Holika was immune to fire and would never be burnt, so the King asked Holika to sit in the centre of a bonfire with Prahlad on her lap, so that the fire could devour him. The bonfire was lit, and young Prahlad sat in Holika's lap, in its centre, praying to Lord Vishnu. His devotion saved him, leaving him untouched by the flames, but Holika was burnt to ashes. To mark this legend, huge bonfires are lit on the eve of Holi, especially in Bihar and the rest of North India. Vrindavan and Lord Krishna's legend of courting Radha and playing pranks on the Gopis are also the essence of Holi. In Hindu mythology, Lord Krishna in his youth has been idealised as a lover, and it is the spirit of his lighthearted, mischievous passion of courtship that enters the Spring festival of Holi. Krishna and Radha are depicted celebrating Holi in the hamlets of Gokul, Barsana and Vrindavan, bringing them alive with mischief and youthful pranks. Holi was Krishna and Radha's celebration of love - a teasing, affectionate panorama of feeling and colour. These scenes have been captured and immoratalised in the songs of Holi: the festival that is also the harbinger of the light, warm and beautiful days of spring. The festival of Holi begins on Duwadashi - on the twelfth day of the waxing moon in the month of Phalgun. Spirits run high as the preparations for the festivities begin, as a custom, mothers make new clothes for their married daughters. 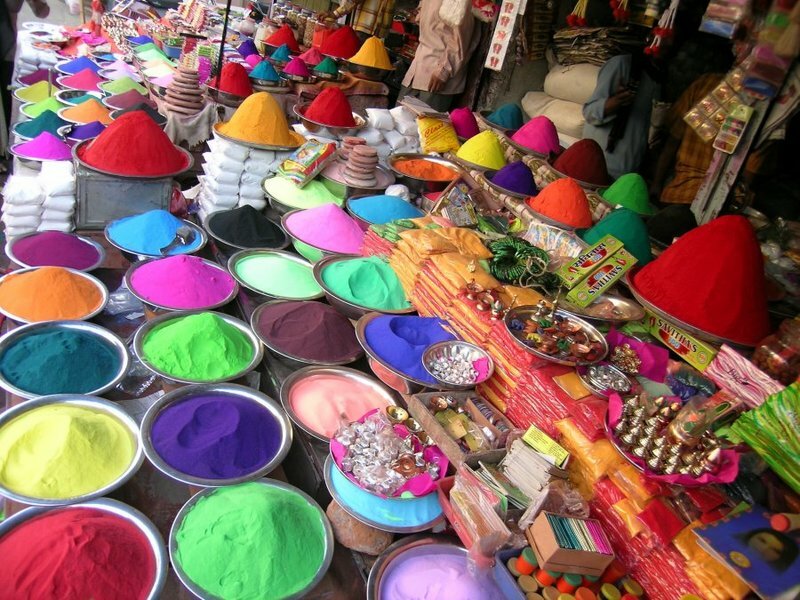 Coloured powder (Gulal) is bought and prepared, long syringes called 'pichkaris' are made ready and water balloons are bought and filled. Preparations are made to cook the special food items that are exclusively meant for this festival. Three days before the full moon, 'Rang Pashi' brings Holi into all households. The families get together in the evenings when people visit each other to perform the formal sprinkling of colour. In the past ‘the household purohit' or priest was invited to begin the celebrations. Today, however this task has been taken over by the eldest male member of the family. A 'thali' or plate is arranged with coloured powders and coloured water is placed in a small brass container called a 'lota'. The eldest male member of the family begins the festivities by sprinkling coloured water and powders on each member of the assembled family. It is then the turn of the younger ones to do the same. In this unique way, affection and blessings are shared by all in the family. The celebrations on this day end with the partaking of food specially cooked for this occasion - gujjia, papri and kanji ke vade. Sometimes, meat dish like kofta curry is also served. It is customary to serve drinks before the meal. The next day is known as 'Puno'. On this day, Holika is burnt in keeping with the legend of Prahlad and his devotion to lord Vishnu. In the evening, huge bonfires are lit on street corners at the crossroads. Usually this is a community celebration and people gather near the fire to fill the air with folk strains and dances. Sheaves of green gram and wheat are roasted in the bonfire and eaten. The actual festival of Holi takes place the day after this. This day is called 'Parva'. Children, friends and neighbours gather on the streets and a riot of colour takes over. Coloured powders called 'abeer' or 'gulal' are thrown into the air and smeared on faces and bodies. 'Pichkaris' are filled with coloured water and this is spurted onto people. Water balloons are thrown at friends and neighbours in the spirit of fun. Sometimes, mud baths are prepared and people are 'dunked' into this amidst much laughter and teasing. The visitors carry 'abeer' or 'gulal' to pay their respects to elders by sprinkling some on their feet. The younger crowd is drenched with buckets of coloured water and pummeled with water balloons. 'Dholaks' or Indian drums are heard everywhere and the songs of Holi are carried by the voices of these merry-makers. There is no 'puja' or worship associated with this festival of colours. Some 'gulal' or 'abeer' is smeared on the faces of the Gods, especially Krishna and Radha, at the commencement of the festivities. There are some quaint customs attached to this festival. Inviting sons-in-law and their families for a meal on this day is a must. When the meal is over, it is customary to give the sons-in-law, what is known as a 'pyala' - a crisp note of any denomination from rupees five to rupees five hundred is offered along with a glass of drink. Married daughters are given what is called 'kothli' or travel money by their mother-in-law, or the eldest lady in the family. Another custom entails a bit of fun, and is usually performed by a new bride with the help of the children in the family. The new bride is supposed to play a prank on the older couples of the family, usually her parents-in-law, and somehow lure them into a room to lock them in. The bride then demands a present for setting them free. The gift is usually a saree or a piece of jewelry. The bride is supposed to sing a song specially composed for the occasion, in which she will demand her ransom. Holi is celebrated in the country with great zest and verve. It is a time to remember the brightness and splendor of living, a time to spread joy, colour and love into the lives of our near and dear ones.